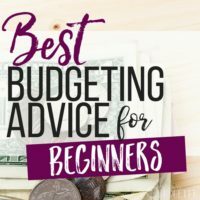 Whether it’s your kid’s birthday or your spouse’s, when you’re looking for ideas to make a birthday special, it’s TOUGH on a budget. Of course you want to plan an awesome party, give great gifts and enjoy an amazing and memorable time. Kids, spouses and everyone can enjoy an awesome birthday without breaking the bank. 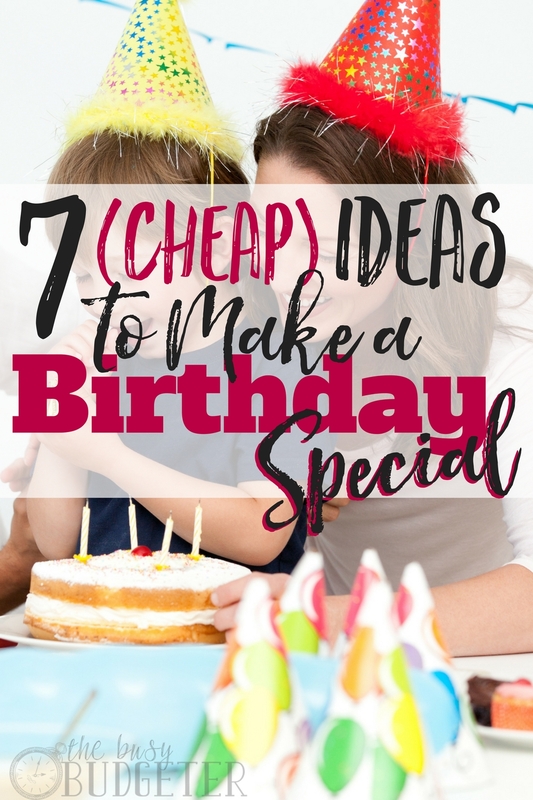 Use these 7 cheap ideas to make a birthday special! What do you remember about your birthdays when you were young? Probably a special cake your mom made, having a bunch of friends over or playing a game you really enjoyed. I’m guessing those memories are much more cherished than tons of gifts or decorations. We spend money on birthdays because we want our kids to experience an amazing childhood. But dropping hundreds of dollars on a party won’t make a difference. Kids will remember an amazing childhood because of the experiences they enjoy, the connections they build and the time you spend with them. Your husband will love a great date, a yummy dinner or doing a special activity with you, much more than more “stuff” you both don’t even need or want. My husband and I tried an online massage date night using a company called Melt and it was way more fun than another “gift” to shove in a corner. It’s about shifting your intentions to the experience over spending the money. You don’t need to spend lots of money to show someone you care. There are plenty of ideas to make a birthday special without spending a lot. Here are seven ideas to make a birthday special and memorable, for cheap! It sounds kind of obvious, but so often we start planning a birthday party and fall down the “theme” rabbit hole. Suddenly we’ve purchased napkins, cups, plates, a cake, balloons, wall hangings and more. I know themes are cute and fun party ideas. I know when you see all those Pinterest-pretty items at the party store it’s hard not to drop tons of money. Instead of going all-out with your theme, I want you to opt to highlight the theme with one or two items and keep the rest of the décor festive and fun (but simple). If you want to use a unicorn theme, a baseball theme or whatever the focus of the party, decorate with a festive tablecloth or wrapping paper. Keep the rest of the items colorful and fun, but don’t run out and purchase every themed item to match. Coordinate items already on hand. For example, if you own black or white plates and cups, use those and accessorize with a tablecloth or fun napkins. Use paper streamers and easy-but-festive decorations. Use your kid’s existing toys to decorate or choose a birthday party theme in their area of interest. You may already own tons of items with your favorite superhero, sports team or latest movie character, so incorporating them into your party will be easy. Look for printable clipart to jazz up your invitations, banners and more without spending money. Your local “dollar store” is also a great resource for birthday decorations. Find balloons, wrapping paper, plates, napkins and fun accessories to decorate for almost nothing. You may also find small toys, containers and other items for your party. If you’re inviting several people to your party, host a potluck. Many friends and family members love an opportunity to bring a dish to share and it’s a real cost saver if you want to host a lunch or dinner. If you’re looking for ideas to make a birthday special, throwing a potluck is a great one! Encourage guests to bring their favorite dish. Encourage friends of your kids to bring a favorite game or item for entertainment. Host a sprinkler party, where each kid brings their favorite water toy. I’ve literally seen kids spend hours of fun with something as simple as a $10 Slip ‘n’ Slide. You don’t need to go all-out. Guests will feel special because they get to contribute and share their own personal touch. Another great “BYO” idea is to ask kids to bring their own stuffed animal friend for a picnic, zoo, or jungle themed party. Host a sports party and ask each kid to bring or wear an item with their favorite team’s logo on it or a hero (or princess) party where everyone dresses up as their favorite character. Making a birthday party special is easy when each guest has a chance to contribute and share in a part of the festivities. 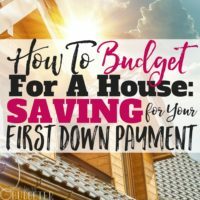 You might feel like you should be the hostess with the mostest and do it all yourself, but really? Your guests will enjoy an even better time if they get to take part in the fun. 3. Keep it Action Packed! The most inexpensive, fun party ideas are the ones where there is plenty of action and activity. I’m not telling you to go out and rent a bounce house, a clown or a pony! Instead, simply keep the party lively and fit in more activity by keeping the party short. A two-hour-long party where kids play a game, enjoy cake, create a craft and go home is much more memorable than a long afternoon where everyone gets bored or cranky. Play music. Plan in a few more activities than you think you’ll have time for. Don’t plan for a long, extended present-unwrapping portion of the party (especially for kids). It turns out, kids tend to get really fussy when they’re sitting and watching a friend unwrap present after present. (You know this.) This is one more reason to pack in more birthday action. The same concept works for adult birthday parties as well. So many parties are themed around food and gifts. Instead, host a game night or a family fun night …both great ideas to make a birthday special. We love poker night with our pals and the kids enjoy running around and playing together too. It’s a fun party idea and it provides an awesome source of entertainment (that doesn’t cost much at all). Set up a birthday “routine” or a birthday tradition to do every year. Think of how meaningful it is when you receive a single red rose for Valentine’s Day or another special “annual treat.” Create a tradition that consists of a simple gesture to signify the special day. 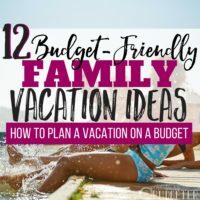 You could start a family tradition where the birthday boy or girl chooses their favorite breakfast, gets to select a movie for the whole family, or even chooses an activity they really love to do. Maybe your son’s idea of a perfect day is watching dump trucks at a construction site and playing at the park. Perhaps your husband would love an afternoon of videogames and watching golf. Carry on a birthday tradition you can revisit every year. It's fun to cook a meal they love, have a chance to bake cookies together as a family or work on a cool art project. Traditions really make a birthday special without going all out and spending a boatload. The tradition itself is a unique, fun signifier of the importance of the special day. Giving an experience is so much more meaningful than giving kids or adults a bunch of stuff they don’t really need. If you're stumped while looking for ideas to make a birthday special with a cool experience, check out Groupon. You can save a ton on awesome activities, from your local theme park to a waterpark to a trip to the racetrack. Groupon offers great deals. Find extra room in your budget by forgoing presents and even selling items around the house if you need to generate income (trade in those old videogames and DVDs for example)! For a kid’s birthday, request no gifts but plan a special activity instead. An afternoon at the children’s museum, a fun time at the local pool, a trip to a local nature preserve or petting zoo…all awesome birthday ideas that don't have to cost a lot. (Look for free or discount days and plan the party then!) Your fellow parents will thank you for a chance to NOT spend more money on yet another toy. A memorable birthday experience is one of the best ideas to make a birthday special and unique. A fun, memorable activity will provide memories to last a lifetime and it's much better than a party and a bunch of presents forgotten in a few months. If you really want to give a birthday gift, opt for meaningful small gifts rather than big “stuff” and more toys. Find really great items at a thrift store—a pretty antique pot, a cool vintage purse, new-to-the owner books or games. Watch for jewelry and fun items at flea markets and other spots where prices are low but items are funky and unique. For kids, watch for items that appeal to their interests. Kids love tiny items and activities requiring creativity, offering a chance to explore their artistic side. When we do give gifts (which is rarely these days), we love giving educational, creative or learning themed birthday presents. Baskets are another great option for gifts—practical items pooled together and packaged in a fun basket or container (which are part of the gift). My family has a great $10 basket gift tradition at Christmas which you could easily use for birthdays as well. Put together creative and cool gifts specially made JUST for the recipient. Edible and homemade gifts are another great option with a lot of meaning. Let your kids draw a card or picture for Grandma or design a game to play with their friends. Even if you aren’t crafty, bake cookies, bread or another food gift, or even pick a bouquet of flowers for a birthday present. If you want to host a memorable birthday, remember to document the day by taking lots of photos. If you’re going for a special experience, a fun activity or a get-together where everyone is excited to participate, you’ll want to capture the day and take pictures. Of course, as the hostess you might not have tons of time to play photographer too, so it’s a great job to assign a friend. After the party, email photos out along with a thank you for coming. You could even go old school: print the photos and tuck them into a card to share the memories with your family and friends who enjoyed the day. You won’t worry about party souvenirs or take-home swag because the photos are great memories. Photos are wonderful gifts and putting together a photo book or even framing a favorite picture is a meaningful and special gift idea and it doesn’t cost a lot at all. Dollar stores offer many frame options, as do thrift stores. Print out a photo or a few photos and put them in a frame. Birthdays don’t mean you need to go all-out and spend a ton of money to create a memorable, fun or really special time. There are tons of fun and cheap party ideas out there. Put together an awesome party and give inexpensive-but-meaningful gifts (or better yet, experiences), and help your loved one feel like a total rockstar on their special day, without spending money. Put together birthdays on the cheap. The day should really focus on the guest of honor and help them feel important and cared for. You don’t need money, gifts or crazy elaborate parties to succeed! What are your go-to ways to save on birthdays? Do you know any unique ideas to make a birthday special? Great tips! I very much agree that experiences have more value than objects or money. I also really like tip 3 (keep it action packed) since people really dislike boring parties. 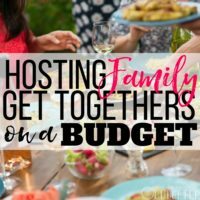 Conversely, being known as a fun host is great and goes a long way to ensure that guests will attend you future parties because they look forward to having fun, rather than out of feeling obligated. This was great timing as today is my husband’s birthday! I think he’ll enjoy a family night with games and food instead of going all out and spending unnecessary money on something he’ll forget about in a month anyway. Thanks Rosemarie for the tips! We are low key for birthdays. No parties, just a family fun day. Birthday boy gets to plan the day and choose dinner. They also get to bring a friend. It’s always a lot of fun! $100 for the entire thing including a gift from mom and one from his two brothers. We at planning to go all out for birthday 13. A ride of passage celebration with extended family and friends. Love this, especially #5. You’ll be teaching your children to value experiences over material things early in life, which is always a good thing. This is a great list! I really love the idea of birthday tradition – something the birthday person can pick and makes the day about them. Game night sounds so fun and great for fun on a budget! Thanks for the tips! We just had our first child (Grace) this past March! *Happy Dance* So, I can’t say we’ve ever planned a birthday party. What we have done as adults are dinner parties at a nice restaurant. But, for Grace, I’ve already started a Pinterest board. IDK what I’m going to do. Why is number 7 so hard to do?!?! And I so agree! Memories are so much better than stuff that will lose interest in a few months! This is so true. One of the gifts that we gave our college age kids was recipes of their favorite meals. I printed them on cute recipe cards and put in a recipe book. It was inexpensive and they really enjoyed it. It was for Christmas but could be for any time of year. Thanks so much for posting this. My son is turning five and I recently took in a foster child whose birthday is a week after his (eek) so I’m scrambling to plan two birthdays at once. Instead of panicking, I’m simply going to dial it down and keep is simple and enjoy our time together, since that’s really what it’s all about anyway. It’s my sister’s birthday next week. Do you have any good birthday gift suggestions please? i need to plan a birthday party for my soon to be 11 year old and these are great ideas for me to remember. I always say that when we were kids a birthday party meant a big pot of boiled hot dogs, cake, presents, and games. So simple, and probably cheap! I hope to keep costs down a well! Very professional post with a valuable content. I love to read this article and share with others. God bless you. You are really making our birthdays special, memorable and lovable. Here is a complete guide to starting your Money Making Blog with Bluehost WordPress Hosting.